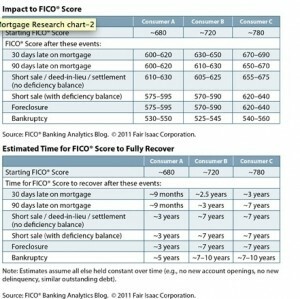 It seems that real estate agents will no longer be able to rely on the credit score rationale for pushing short sales. The old mantra has been that shorts sales have less impact on your credit rating. Unless you have a bank that is proactive enough to approve a short sale before you have actually defaulted on your loan, it appears that the difference between a short sale and a foreclosure is no longer appreciable. According to Fair Issac Corporation, the company that brought us the FICO score, homeowners with short-sales and foreclosures on their records ended up with similar credit scores, assuming their scores were similar as distressed homeowners.